They’re sick of listening to you. They’re sick of your unreasonable demands that they actually learn something today. So that’s when you need to get out your crazy. I’m a firm believer that sometimes you have to put on a show in the classroom. Whether you like it or not, sometimes that’s what gets students engaged and drives the point home for them. DISCLAIMER: Now, when I say be a crazy teacher, I do not mean be a “crazy difficult,” “crazy mean,” or mentally unstable teacher. I mean that sometimes you need to be brave enough to do the unexpected–the unsettling or weird–to promote curiosity and thought. It adds excitement and energy to the class. It usually adds humor to the class. It makes students think about the material and life differently. It has to potential to be an authentic experience you share with your students. By putting yourself out of your comfort zone, more students are comfortable doing so. 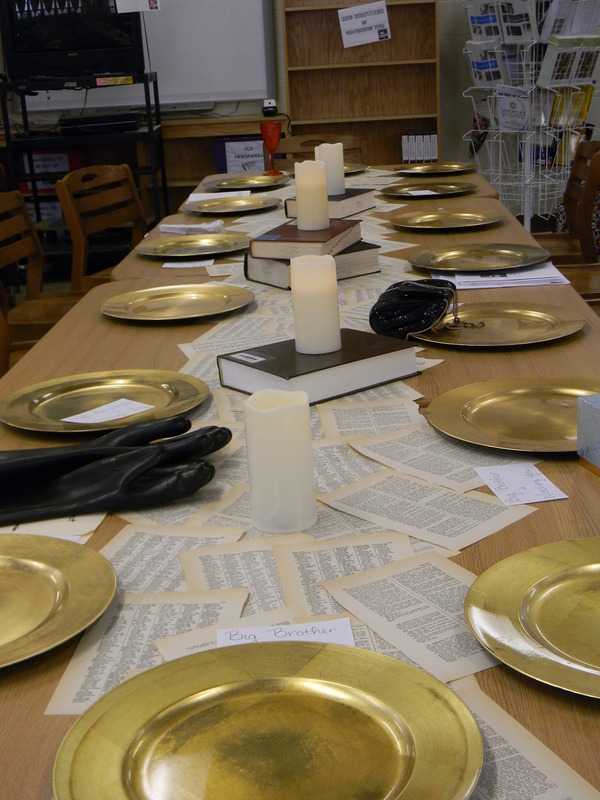 Now, one of my favorite examples is from when I taught The Book Thief by Markus Zusak to my 10th graders. My instruction was getting a bit stale. Even though the students loved the story, I wanted to really drive home one of the major themes: that one could find beauty in brokenness and ugliness. I ended up checking out The Picky Girl and her AMAZING blog post on The Book Thief. She offered some pretty crazy ideas, that I chose to emulate in my classroom. I tore up a book in front of my students. We were in the library and I had already talked to the librarians, procured a book they were going to recycle, and asked them to act shocked when I started tearing it up–it’s always fun to involve other people in your crazy. After students were seated, I started to discuss with my students the theme of the importance of words and language in the novel. We talked for a couple of minutes about the importance of words to Liesel, our protagonist, and to Max, a man who was saved by a book. After a while, I started to disagree with them. I played devil’s advocate and said that words were simply symbols, just scratches on paper. I took my previously-planted book from the shelf and said that there was nothing special about words. Then I started tearing it up. I started handing out pages, gliding around the room to the beat of torn pages. That’s when they started to protest. They started to get it, and eventually I broke and told them that the book would have been recycled anyway. Then the learning began. I discussed with students what inspired the “ruining” of this book. I had them do a quick write about their reactions and how what I did connected to The Book Thief. Then I assigned them their homework. They had to take the ripped page and turn it into something beautiful. They had to find the beauty in the ruin, just as our characters had and then explain it in tomorrow’s class. 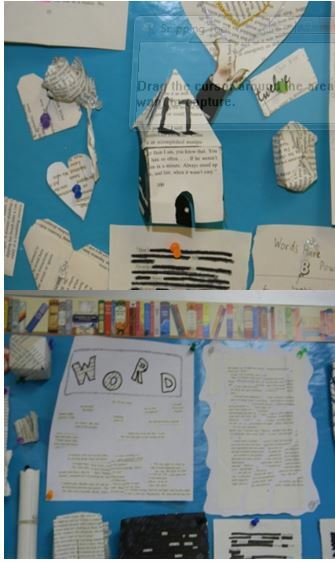 We hung them all on the wall to remember the power of words. Look at the house! I love it! Such a variety of ideas! The Bottom Line: Sometimes it pays to act a little kooky in the classroom. 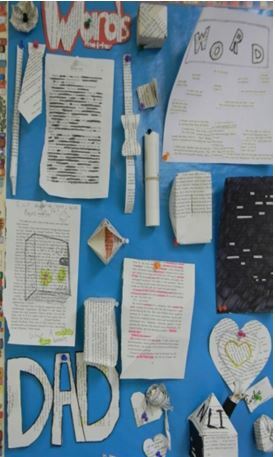 These “crazy” ideas and actions–like an English teacher sacrilegiously ripping up a book–can lead to some pretty balanced, engaging learning. So, I think I am officially addicted to these little ASCD ARIAS books. With Common Core looming over us all, one of my main goals for this summer is finally establishing a vocabulary routine for my students that works. I honestly thought it was too much to ask for. And then in comes this handy little book by Marilee Sprenger. You may have seen my review of another ASCD ARIAS book The Five-Minute Teacher by Mark Barnes–if not check it out here. These little books pack a punch and attempt to give educators as much bang for their buck as possible. They are relevant and could easily be read in on a Friday and incorporated into class on a Monday. Vocab Rehab is definitely worth the 5.99 price! Vocabulary can be taught and reinforced in 10-5 minute instructional blocks. She has loads of ideas in the book. Improving your vocabulary is all about connections: draw a picture, connect it to synonyms and antonyms, make it a song, act it out, play games, have fun with it! 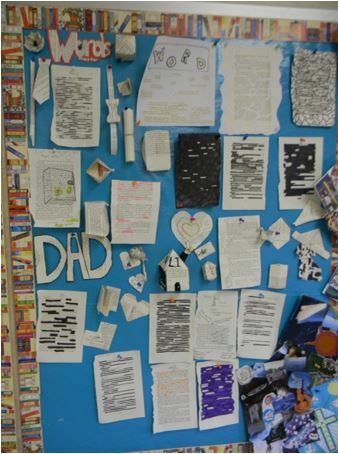 Bring back the Word Wall–>I’m going to call mine the Wicked Word Wall for added alliteration. Assessment should go beyond the small quiz and vocabulary should be incorporated in writing and oral assessment as well. The Bottom Line: Overall, I found this to be a perfect read for what I’ve been trying to do in my classroom next year. I also think that some of her strategies could help with grammar instruction as well. This book really made me believe that vocabulary instruction is important, fun, and doable! We all have our go-tos in our classrooms. I thought I would share one of mine that has worked really well in discussion. 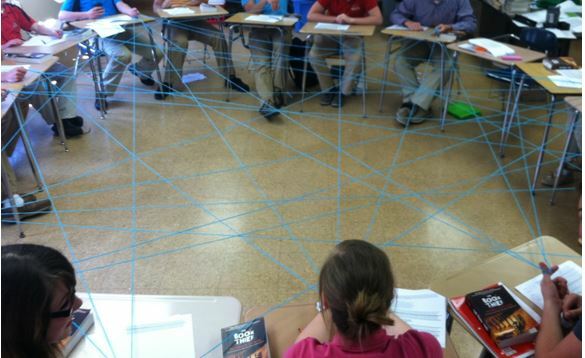 I call it a “Web of Conversation.” When I was in student teaching, one of my fellow student teachers tossed the idea to me. It wasn’t until last year that I ended up using it. I’m not claiming this as my idea or as a particular revolutionary idea, but it is a lot of fun and all my students look forward to this type of discussion. As much as I love high-tech things, I also like low-tech options. Some people use Harkness to moderate Socratic or full-class discussions. I usually just sit us all in a circle, and throw around some yarn. I usually sit down with a class list and tally people’s responses or write down particularly interesting comments from students. Wrapping it up: simply get the yarn towards the end of the discussion and just start rewinding it. The students will let go of the yarn in the opposite order. DO NOT HAVE ALL STUDENTS LET GO OF IT AT ONCE: it will tangle, you will have to cut it. The Smore is not just for summer bonfires, but all year long! 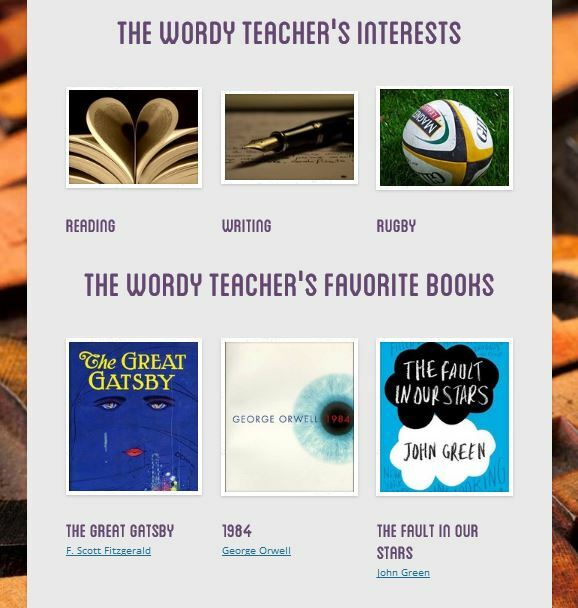 After reading The 5-Minute Teacher by Mark Barnes (check out my review here), I stumbled onto Smore.com. This nifty site allows you to create online flyers for a variety of things. Now, of course, I’m looking at its potential in the classroom. Just a bit of my background and an introduction! So my kids know a little bit of my teaching style and how to get a hold of me. There are even links to buy the books off amazon. The Bottom Line: My kids will be using these a lot this year, and I am super excited to use these to present myself to my students at the beginning of the school year. This is definitely a great addition to my teaching toolbox! After stalking around one of my favorite educator’s blogs, The Nerdy Teacher, I found this book recommendation. I just finished this nifty little book about creating a more student centered classroom environment. One of the main goals of Mark Barnes short professional guide is to minimize lecturing and push students to learn more independently. A little about ASCD: This organization was formally known as the Association for Supervision and Curriculum Development. These leaders in education innovation put out the ARIAS series to enable teachers to learn more about the new developments in the educational world. What I really like about this 50 page book (and its counterparts) is that it is meant to be as inspirational as possible and still short enough to be read in one sitting. I read it in the summer, but could easily have read it on a normal school weekend and started integrating his philosophy into my classroom on Monday. I found this book to be truly worth the 5.99 price from amazon. No teacher should lecture for more than 5 minutes. Instead teachers should get students started and let them inquire, research, discuss, etc. independently and collaboratively. That there is an art to learning when to shut up and let the kids do it on their own. Barnes has a VERY large emphasis on video in the classroom–using video to introduce material or provoke questions/curiosity in students. This book is really accessible, but of course, the best stuff I got out of it was the technology suggestions. 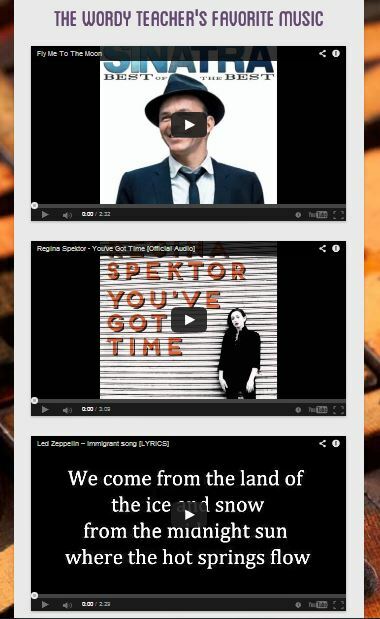 It gives some great resources for being able to engage students and allow them to work independently. My two favorite were Smore and Padlet (both easily embedded into Schoology for students to use). Mark Barnes also has a great website with awesome tech/teaching resources called Learn It In 5. The Bottom Line: I kinda think of this as dynamite. Teachers light the fuse, back away, and let the kids’ minds explode with ideas and possibilities. This might be a weird metaphor, but too bad…I like it. So check it out and see how you can be effective in just five minutes. Interested in Smore? Check out my review of smore.com here! Like The 5 Minute Teacher? Check out my review of Vocab Rehab, another ASCD book! The Best of 2013-2014: Carpe Diem! 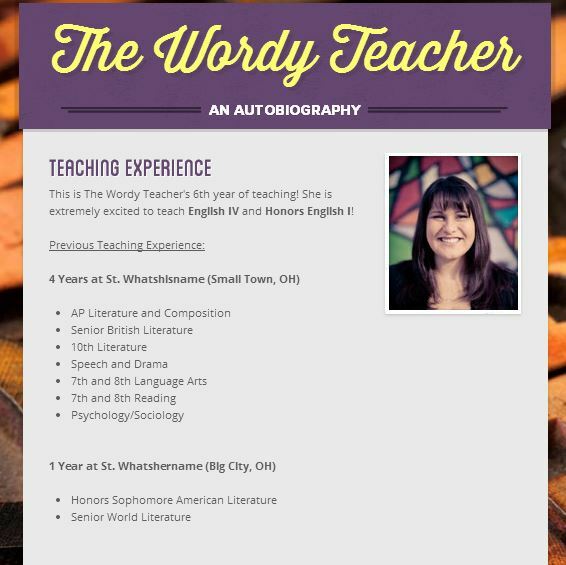 Like many English teachers before me, I have had a secret/notsosecret dream for my teaching career. I wanted to be Mr. Keating from Dead Poets Society. I wanted to inspire, push kids to be their best, and be a teacher they remembered. I wanted to be that person who made them stand on their desks and question their perspective of the world. I acknowledge this is a little egotistical and pretty idealistic. My response to that: who better than an English teacher to wish this then? I showed Dead Poets Society to my seniors after our unit of British Romanticism. On the chalkboard I wrote CARPE DIEM in broad, sweeping letters and left it up there for the rest of the unit. We discussed the poetry taught by Keating, and the character development and symbolism in the movie. After the movie wrapped up, we had a large group discussion over the themes, Neil’s suicide, and Keating’s teaching methods. Their final assignment was to write a poem in response at the end of the movie. They had to read them at the end of the week, and I was extremely impressed with their connection to the theme of CARPE DIEM. These were a special group of seniors. They were kids that thrived under nontraditional teaching methods, and tried to connect the literature to their lives. I taught this is April…in May I started realizing what I started. As the weather broke, I started notice CARPE DIEM all over the school: they painted in on the rock outside the school; it was on their lips in the hallways; one kid even got a tattoo of it. Even the kids who hated English took it up as their personal motto. Now, this is no novel motto or idea…but for those kids in small town, Ohio…it was novel, it was revolutionary. At the end of the quarter, I received many letters from my students calling me their Keating, thanking me for an unforgettable senior year. It was all them, I told them…they were the ones that made their lives, these lessons extraordinary. He stood on his chair, huge smile, blonde hair, CARPE DIEM tattoo. His whole table said in rounds. The entire first period stood on their chairs, looked down on their bawling English teacher with faces I’ll never forget. This was truly an extraordinary end of the year…my teacher dream fulfilled in simply five years of teaching. How do you bottle that? How do you recreate that? Should you even try? Just take it as a singular moment of greatness? I’ll never forget my last days at my former school, those last days with my seniors who seized the day. I finished my last year of teaching AP this year. I got a new job, and will probably not teach AP for a long time. It’s pretty bittersweet to not be a part of this great class. For those of you who haven’t taught it, AP English Literature is an English teacher’s dream. Although you have to make a lot of decisions in terms of the curriculum, the caliber of student and the caliber of discussion are unparalleled. 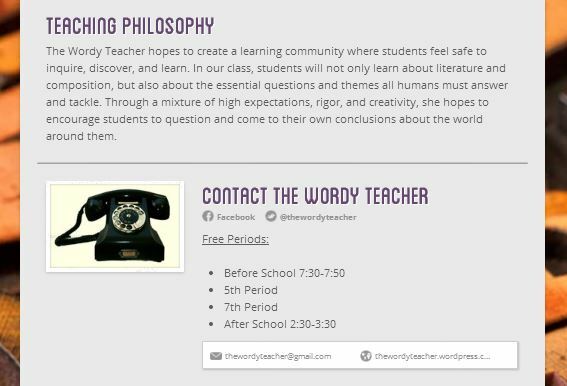 This is the class where students are able to connect personally with literature while still working on advanced analysis skills. You can push kids to become so much more than they ever thought they could be. We would all dress up like characters from the novels we read as a class. I tended to be something kind of humorous—a drowned Ophelia, Big Brother, the green light from The Great Gatsby. My seniors were so in to this. They were so convincing, and some of them utterly REFUSED to get out of character—I’ve encountered some pretty intense Victor Frankensteins and O’Briens. Students write letters as their characters to other characters attending the banquet. They also have to present these letters in a creative, fun way. 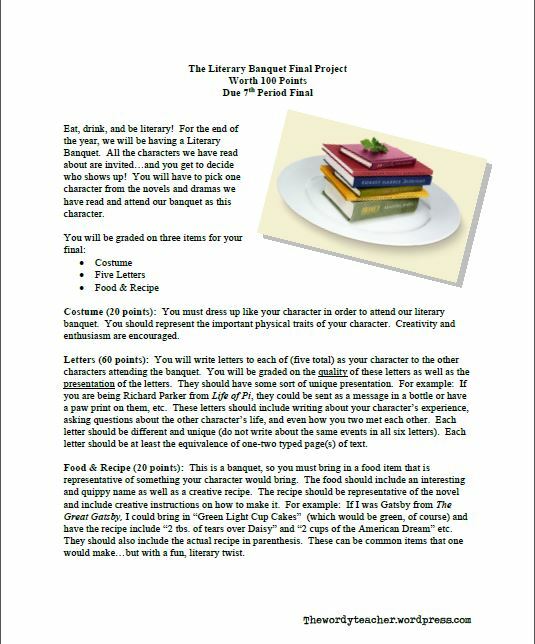 Students MUST bring a literary inspired dish. I have tasted Nurse Ratchet’s “Vegetable” soup, Myrtle Wilson’s love potion, and even Siddartha’s “Om”meal cookies—all delicious. It has always been a lot of fun, and usually a pretty emotional time with my students. It is also when I gave my final speech to them, and presented them with their final presents: a notebook specifically picked out for each student with a letter from me inside. These will always be some of my favorite memories with my students, and it always solidified the learning community created in AP. Hopefully you find these resources helpful and inspirational!